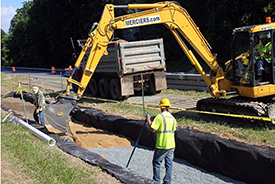 Structural stormwater management (SWM) controls are engineered best management practices (BMPs) to reroute stormwater runoff from developed areas. SWM controls reduce pollutants and slow runoff to minimize discharge to local waterways. 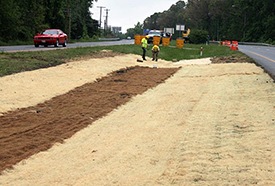 The Maryland Department of Transportation State Highway Administration (MDOT SHA) identifies roadways that don't have these controls and installs BMPs to improve the water quality of roadway runoff. The SWM Act of 2007 applies environmental site design (ESD) to the maximum extent practicable (MEP). ESD uses small-scale SWM practices, non-structural techniques, and better site planning to mimic natural runoff and minimize land development's impact on water resources. Grass swales are grass-lined channels that convey stormwater runoff ,provide water quality treatment and decrease flow. They remove pollutants through vegetative filtering, sedimentation, biological uptake, and infiltration into the underlying soil. 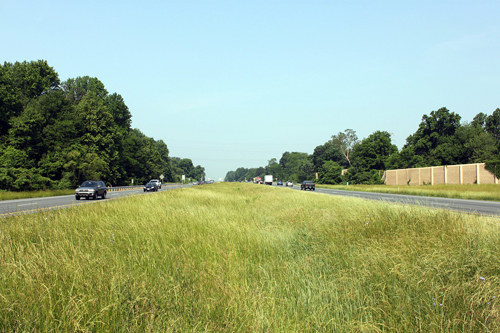 The linear nature of grass swales makes them right for roadway medians and side channels. 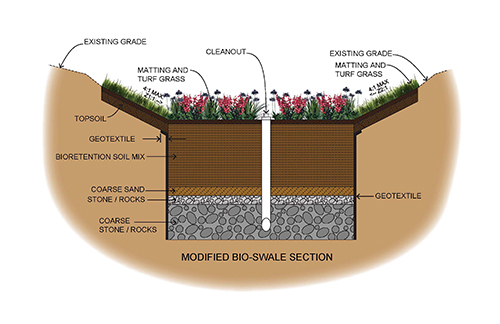 Bio-swales are linear constructed filters that also carry stormwater runoff, treat water, and decrease flow. They collect runoff from roadways and allow water to slowly filter through layers of soil, sand, and stone. They discharge through an under-drain that is usually connected to a storm drain inlet. Pollutants are removed by filtering runoff through 2 to 4 ft. deep engineered soil media that remove the maximum amount of pollutants. 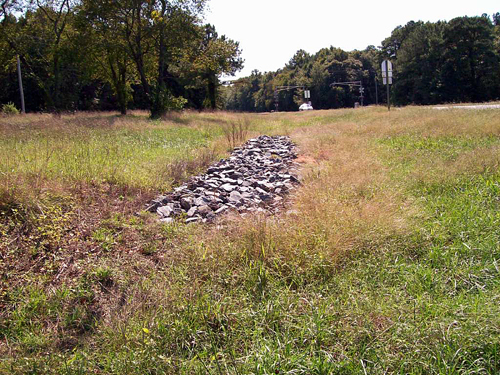 Check Dams are often used to enhance surface water storage, which filters better. 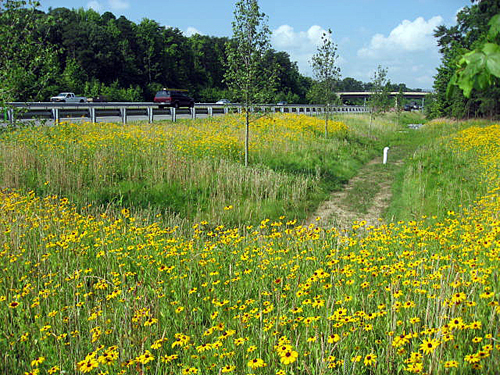 The linear nature of bio-swales makes them suited for placement along roadway medians and side channels. Wet ponds are large-scale 'practices' with a permanent pool. They combine an extended detention or shallow wetland with a permanent pool. A wet pond uses both a forebay and permanent pool to treat stormwater runoff. Stormwater runoff is filtered and treated through settling and nutrient uptake by plants and other aquatic organisms. Infiltration trenches are excavated and filled with stone to temporarily store stormwater runoff. Runoff captured by these trenches percolates into the surrounding soil, where pollutants are removed by natural filtration before recharging the groundwater. 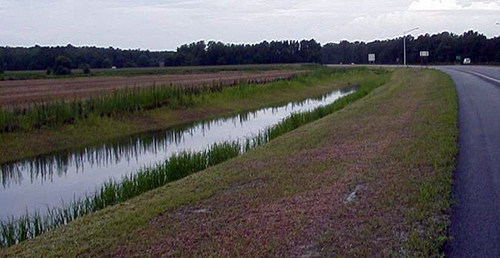 The linear nature of infiltration trenches makes them suited along roadside channels. Submerged gravel wetlands are small-scale filters that use wetland plants in rock to treat water. Pollutant removal is obtained through biological uptake from algae and bacteria growing within the filter media. 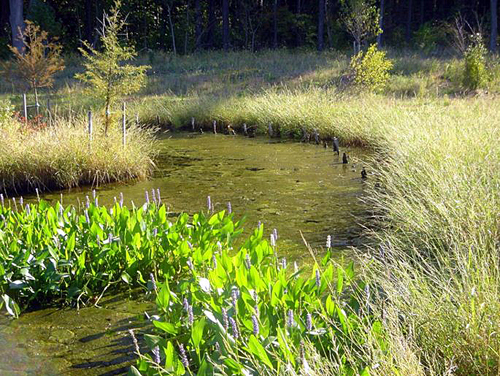 Wetland plants provide additional biological uptake. Submerged gravel wetlands are best suited in areas with a high water table or poorly drained soils. Wet swales are channels with permanent pools that provide conveyance, water quality treatment, and flow attenuation of stormwater runoff. They collect runoff from roadways and let the water pool within the swale. Adding check dams to wet swales often used enhances surface water storage. Pollutants are removed through vegetative filtering, sedimentation, and biological uptake. Wet swales are installed in areas with a high groundwater table or poorly drained soil. The linear nature of wet swales makes them best along roadway median and side channels. Sand filters are practices that capture and store runoff before passing it through a filter bed of sand. Sand filters are typically designed with a forebay and a filter bed filled with soil, sand and stone. As stormwater flows into the forebay, large particles settle; then finer particles and other pollutants are removed as stormwater flows through the filtering media. Pollutants are removed through filtering, sedimentation, biological uptake, and infiltration into the underlying soil. Filtered runoff may collect and return to the conveyance system or partially infiltrate the soil. Bioretention facilities capture and temporarily store stormwater runoff before passing it through a filter bed of soil, organic matter, sand and stone. Pollutants are removed through filtering, sedimentation, biological uptake, and infiltration into the underlying soil. Filtered stormwater either returns to the conveyance system or partially infiltrates the soil. 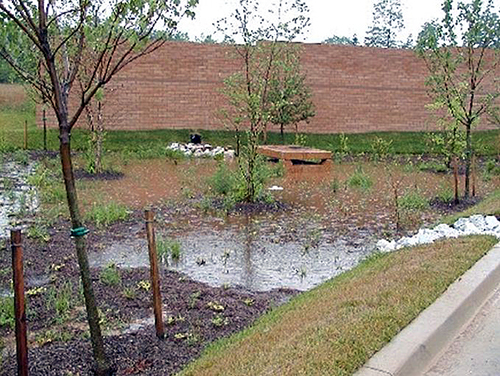 Bioretention facilities provide water quality treatment and aesthetic value. They can be integrated into landscaped areas. Stormwater wetlands are large-scale practices that create shallow wetland areas to treat stormwater. They incorporate small permanent pools and/or extended detention storage. 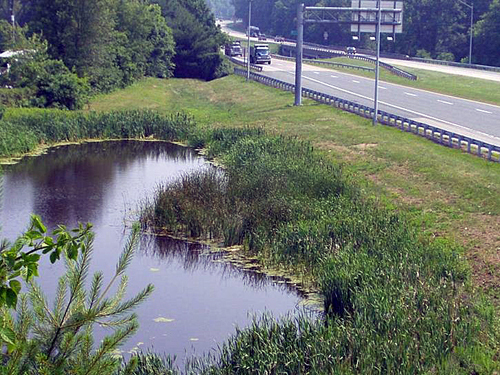 Stormwater wetlands are structural practices like wet ponds that incorporate wetland plantings into the design. As stormwater runs off through the wetland, pollutants depart through sedimentation and biological uptake. 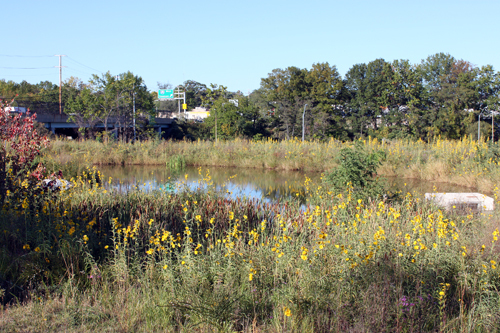 An added benefit of stormwater wetlands is their aesthetic appearance and contribution to the surrounding habitat. Stormwater control retrofits modify, enhance, or replace existing structural SWM facilities to improve water quality treatment of stormwater runoff. SWM facilities built in the 1980s and 1990s didn't remove as much pollution as newer facilities designed to modern standards. These older dry detention ponds are a primary target for retrofit because they remove only a small amount of pollution. They are converted to wet ponds, wetlands, or infiltration basins, where more pollutants can be removed. 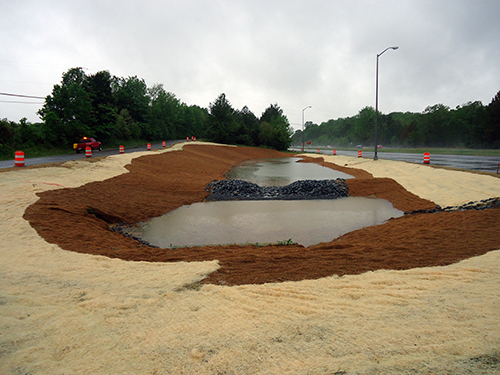 Stormwater Retrofit MD 4 and Plummer Road from a Dry Pond to a Shallow Wetland.